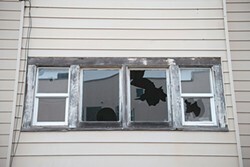 Improvements have been made to the 833 H St. apartment complex owned by Floyd Squires, pictured here after earthquake damage in early 2010, but broken windows and other repairs remain to be done at the building that was the subject of a succesful nuissance lawsuit brought by neighbors. 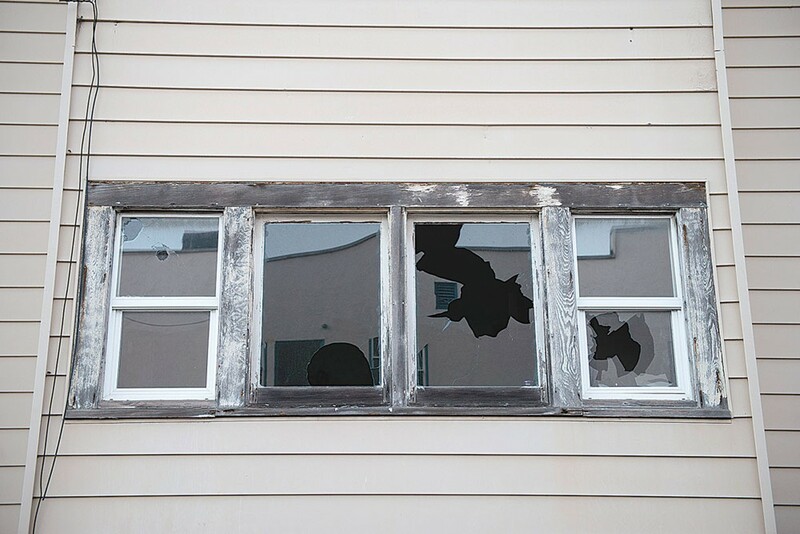 Broken windows seem to be a pervasive problem at many of Floyd and Betty Squires’ Eureka properties, 26 of which have been the subject of a years-long legal fight with the city of Eureka. The apartment complex at 833 H St. in Eureka has seen better days. Nearly a dozen broken windows dot the walls of the two-story building and overgrown shrubs encase tendrils of blackberries that reach out toward the sidewalk. Curtains fluttered behind the fractured panes on a recent afternoon. Some of the peeling blue window frames stood propped open with books, while others appeared boarded up from the inside. The building is among others owned by Floyd and Betty Squires that are awaiting or have been undergoing repairs in recent months after a judge placed 26 of the couple's properties into what's known as a "receivership" in 2013. One batch was signed off as completed in August, a small step forward in the city's quest to bring the properties into compliance with building codes. The process is still ongoing nearly six years after the city first filed the lawsuit against the Squireses, claiming their conduct was akin to that of "slumlords." The filing itself was the culmination of a decades-long labyrinth of litigation between the two parties over conditions at the couple's 200 or so rental units within the city limits. Put simply, the city didn't feel the Squireses could be trusted to undertake the repairs necessary to make their rental units safe and livable, so they asked a judge to step in. The judge presiding over the case — Dale Reinholtsen — eventually appointed an overseer, known as a receiver, to inspect the properties and monitor the completion of needed repairs, ranging from simple tasks — such as installing smoke detectors and fixing broken windows — to more substantial overhauls, including replacing rotting floors and addressing structural deficiencies. Brian Gerving, Eureka's public works director and chief building inspector, described the progress as "frustrating." So far, he said, Squires has missed all of his court-ordered deadlines. Calling the city's petition for a receivership an "extreme remedy," Gerving said the city's hand was forced by a "pattern of violations" that had been going on for years without resolution. "For whatever reason — willingness, ability, whatever the case — we haven't seen Squires take the necessary steps to cure violations at the properties," he said. Squires, who declined to comment for this story with the exception of a few brief statements, sees it differently. "We're proceeding to get everything signed off by the city," he said. At a July court appearance in a separate but related case, the 70-year-old, who cut an almost grandfather-like figure on the stand in a sports jacket with his stark white hair and beard, characterized the receivership lawsuit as "senseless." "It was like being hit in the head with a hammer," he said. That testimony came during the jury trial of a trespassing and invasion of privacy lawsuit that Squires unsuccessfully brought against the receiver originally selected by the city. The spinoff legal action was just one of many unusual twists and turns since the city filed the receivership case in January of 2011, alleging the Squireses had engaged in a long-standing pattern of maintaining "substandard and unsafe conditions" at their properties. As one of Eureka's most prolific landlords in a city plagued with a shortage of low-income housing, Squires has developed a reputation for taking in tenants no one else will, including those with histories of evictions and bad credit. With Eureka's Housing First approach to dealing with homelessness putting pressure on existing housing stock — starting with the city's joint pledge with the county to get 30 homeless people into housing in 60 days — Squires should be a key player, an ally, in the city's housing push. Instead, Squires and the city remain at opposing counsel tables in a courtroom, with the city insisting many of his properties don't meet basic minimum standards to keep renters safe. "Another point I've made many times," Gerving said, "is, yes, there is a segment of the population that needs to be housed and it's important to have options for that housing. However, that doesn't mean they should be forced to live in conditions that put them at risk." The Squireses had amassed 77 code actions over an eight-year period and had accrued nearly $500,000 in citations, fines and special assessments by the time the lawsuit was filed. Going property by property, the city outlined a long list of problems, ranging from pigeon and cockroach infestations to hazardous wiring, deteriorating walls and a lack of running water. Reinholtsen appointed Mark Adams as a provisional receiver over the 26 properties in March of 2011. Squires immediately appealed the decision and posted a $50,000 "undertaking" to stay the ruling for the time being. His appeal was later dismissed as moot by an appellate court. Another hearing took place before Reinholtsen in June of 2011, with 34 witnesses offering testimony. This time, the judge placed six of the properties that he deemed "a substantial endangerment" to residents and the public under receivership. That, again, was short lived. Squires filed an appeal the day after the October 2011 order, which for a second time put the receivership on hold. A four-week-long trial followed a year later. In July of 2013 — more than two years after Eureka filed the lawsuit — Reinholtsen ruled violations at the properties did not pose extensive health and safety risks or rise to the level of public nuisance as the city had argued, but noted there was evidence of those issues in the past. "Squires has presented evidence that many of the violations have been corrected," Reinholtsen wrote, citing the testimony of an expert witness who inspected the properties. Gerving said that's one of the Squireses' practices: to employ a flurry of activity when the pressure is on. But the flurry of activity wasn't quite enough to avoid the hammer. While Reinholtsen found the properties didn't pose immediate health and safety threats, he agreed with the city's argument that the Squireses' maintaining them in substandard conditions gave them an unfair advantage over other Eureka landlords that were in compliance with city and state codes. Reinholtsen ordered the properties back under receivership, which is where they remain today. Squires' attorney Bradford Floyd described the ruling as a "loss" for the city. "They got almost nothing that they wanted, that they were asking for," he said, adding he plans to file a motion for attorney fees at the conclusion of the case. Attorney Krista MacNevin Jee of the Fullerton-based law firm Jones & Mayer, which is representing the city, called Floyd's assessment "inaccurate." "The bottom line is that a receiver was appointed to compel correction of the properties, and the receiver has thus far been ordered to be paid for by the Squireses," she said in an email. The last bill for the receiver's services, according to records from an April court hearing, came in at $20,000. The Squires receivership case stands out for a number of reasons, including the number of properties involved and the extended timeline, according to Jee, whose firm specializes in receiverships and unfair business practices statutes. But perhaps the biggest anomaly is the role the Squireses have played in the process. Generally, court-appointed receivers are given full control over the properties. They are granted the ability to collect rent and take out short-term loans to pay for ordered repairs. They come in and gets the work done, with the owners completely cut out of the arrangement. "Normally, that's the advantage of a receiver," Jee said. In this case, the Squireses continue to operate as landlords under what Jee described as a "hybrid system" set up by the judge. While the receiver, former Humboldt County Planning Commissioner Jeff Smith, outlines the course of work needed at each site, the couple oversees the repairs, including picking up permits and requesting inspections. That, Jee said, has led to delays at every turn. Floyd paints a different picture, saying the system has worked out well and repairs are on track to have most of the residential units done by the end of August. Smith, who was the Squireses' choice for the receivership position, meets privately with Reinholtsen to discuss the progress. "Jeff has done a great job at it and gone through property by property," Floyd said. He described Smith's role as more of a referee, saying the Squireses and the city often disagree on the scope of work that needs to be done. "What was happening was they were saying the light was red and we were saying the lights were green," Floyd said. Long before the case of City of Eureka vs. Floyd Squires made its way into Reinholtsen's courtroom, the two sides had been engaged in an escalating standoff over code violations dating back to the mid-1980s, a few years after Squires said he acquired his first property in Eureka. That, according to his testimony at the trespassing trial, was in 1978, when President Jimmy Carter was in the White House and Grease was the top grossing movie of the year. Other property purchases followed and the troubles between him and the city of Eureka surfaced soon afterward, according to court documents. Over the ensuring years, Squires accrued a litany of citations from the building department — so many that the Squireses now have their own storage section in city hall, mainly due to the ongoing receivership case, Gerving said. Things had reached a sort of febrile pitch by late 2010 when Squires filed a lawsuit alleging that he and his wife, Betty, were being unfairly targeted by the city and singled out "from all other property owners in this community ... for the specific purpose of harassing, vexing, annoying and/or harming [them]." The court ruled against Squires and the city was eventually awarded attorney fees. Around the same time, city officials were serving inspection warrants on the Squireses' rental units. The receivership case followed a few months later. During the trespassing trial, Squires called the receivership case an act of "retaliation" for the legal action he brought against Eureka and several officials, including Gerving. "Prior to 2010, we encountered a lot of problems with the city getting involved in some of our tenant disputes at the time, so we filed the harassment case in 2010," Squires said. While the Squireses are not the city's largest landlord, Gerving said the couple stands out in the sheer number of violations and lack of responsiveness to notices and fines. Others own a similar amount of property but don't carry the same enforcement baggage. The dozens of files documenting code and safety violations at Squires owned buildings could cover a small conference table with piles of paper stacked inches high, he said. The only titleholders that match the Squireses for want of remedial action are foreclosed properties under the control of banks, Gerving said. "The city filed this case because we were concerned at the number and severity of violations at the subject properties and what we see, five and a half years later, is that in many ways we're at the same spot as the day we filed and that's concerning because there are safety issues present," Gerving said. Even before Eureka sought to wrest away control of his properties, Squires had seen his fair share of time in court. Humboldt County records show more than 400 cases bearing his name, including small claims actions by tenants and a long list of his eviction proceedings, constituting a paper trail that dates back decades. Over time he's sued and been sued, with many of the voluminous files centered on the Eureka properties that Squires owns with his wife Betty. 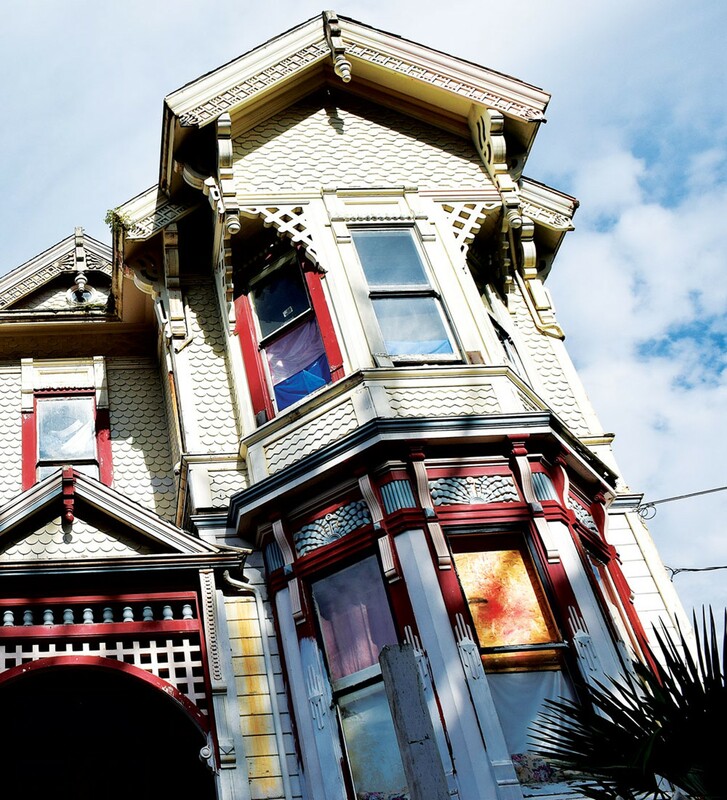 Among those was a nuisance case in 2011 brought by neighbors of 833 H St., who said they feared for their safety and had lost value in the historic homes they worked hard to restore due to the pervasive problems at Squires' apartments. 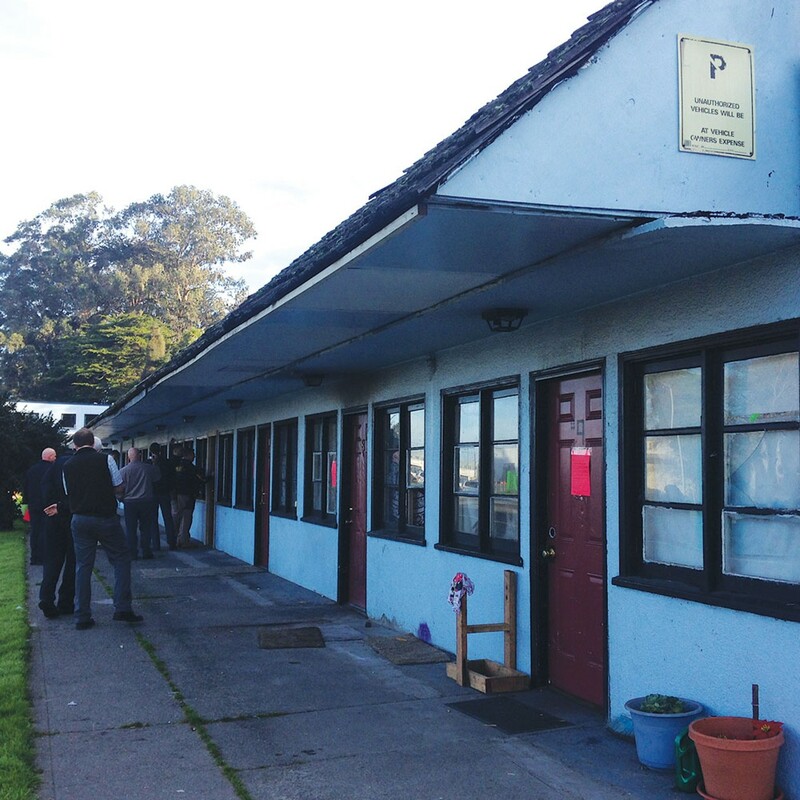 The building, according to their lawsuit, attracted "drug users and dealers, transients, disruptive, loud and inebriated person, criminals, pitbulls, and other undesirable traffic in to the neighborhood." A judge collectively awarded the neighbors more than $100,000 for emotional distress and economic damages in 2014, an award that was eventually settled with Squires' insurance company, the prestigious Lloyds of London. Squires has also had other financial problems related to his properties, including currently owing nearly $2 million in defaulted property taxes, according to county records. Humboldt County Treasurer-Tax Collector John Bartholomew said his office is "very familiar" with the Squireses. Over the years, a number of his properties have gone into default, with some moving close to the final stage of being auctioned off before the delinquent bills are paid. "As a rule, they come in and pay it off at some point prior to being sold," Bartholomew said. Squires does have some properties over the five-year mark that would normally trigger a sale, but that's been put on hold due to the ongoing litigation, Bartholomew said, adding that is the county's general rule under such circumstances. "As far as I'm aware," he added, "Mr. Squires has never let one of his properties be auctioned." So where does the case go from here? 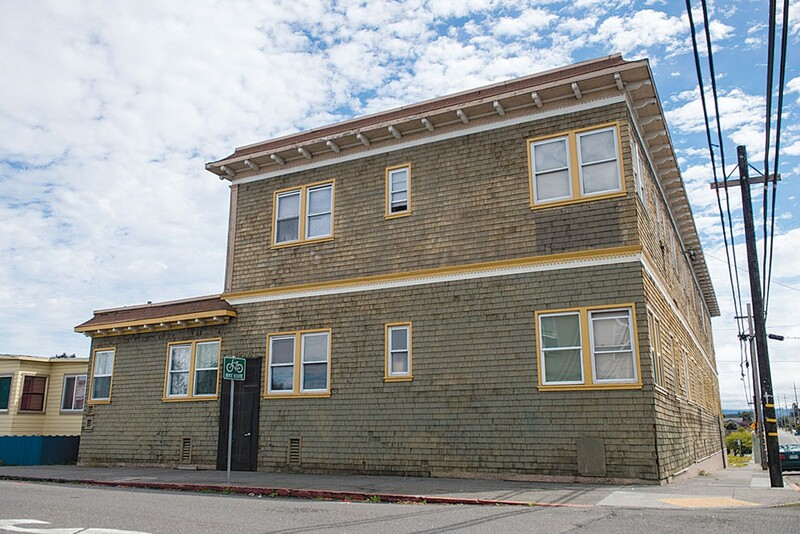 The stucco building at 833 H St., the site of 50 police calls in the last year, now stands among the last of the 26 properties slated for repair under a prioritized work schedule that started with the simplest projects before progressing to the most complex. Also included on the final list is the now boarded up Blue Heron Motel, where downtrodden residents once lived in conditions an official described as "subhuman," as well as the historic Lloyd Building on Fifth Street, which has been the subject of litigation since 2006 over a lack of seismic retrofitting. 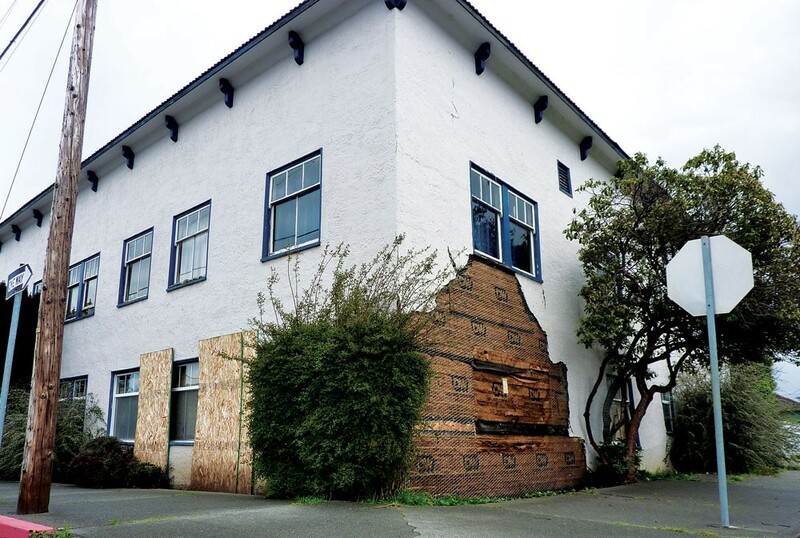 Built in 1915, the unreinforced masonry building suffered damage in the January 2010 earthquake, and officials argue it is a threat to public safety. Depending on which side you talk to, the repairs are either caught in gridlock or moving toward the finish line. With the hardest work still ahead, the city has asked the court to "at long last" place the final renovations solely in Smith's hands. "It isn't a matter of the repairs themselves taking too long, it's that at every step of the process it's been taking too long," Jee told the judge. "The question is why is it taking so long?" Floyd suggested Smith be given the discretion to take over, but only if he sees a need. There is one thing city officials and Floyd appear to agree on: It didn't have be this way. Their perspectives on why, however, are as opposite as night and day. "A lot of the violations, while some of them are very concerning to us because of the threat they pose, many of them are not difficult to deal with," Gerving said. "Any reasonable person, acting with a reasonable level of diligence, would be able to facilitate these repairs without any problem." "This litigation process can't be pleasant for anybody," he added. "It's certainly not how I would prefer to spend my time. It would have been quicker, cheaper and easily less stressful for everyone involved for them to have fixed the violations long ago." A checklist of complete projects from the last round of repairs rang up at nearly $70,000, according to inspection status reports. Floyd estimated the city has accrued $1 million in outside legal costs in the suit against his client, money that he says would have been better spent assisting the Squireses in getting the buildings repaired rather than "being an impediment." "They're trying to run the Squireses out of town. They're trying to break the Squireses' back. That was the whole purpose of this lawsuit," Floyd said. "The city's the one that started the fight." "They were, as far as I'm concerned, very shortsighted," Floyd said. For now, Reinholtsen is weighing the city's motion for Smith to take control. Jee said Squires has come up with his fair share of reasons over the years for why work can't be completed in a timely manner: He'll say he's trying. That he's doing his best. That he can't get access to a tenant's apartment. "The city's been around long enough to hear them all," she said.